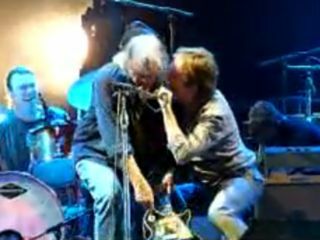 Paul McCartney joined Neil Young at London's Hard Rock Calling in Hyde Park last night for a riotous rendition of The Beatles' classic A Day In The Life. The crowd, perhaps expecting Young's encore set-closer of the Fab Four song (see our Tweet of Neil's explosive Glastonbury finish), went wild when McCartney ran on stage right on time for the middle section. Young and McCartney hugged and sang together, and then Macca darted off to thunderous applause. But as Young proceeded to wreak havoc on Old Black, his trusty '53 Les Paul - another nightly ritual - for the song's crescendo, McCartney came back out to take part in the fun. Good thing A Day In The Life is the final number in Neil Young's set; otherwise, his guitar tech would have his work cut out for him getting the axe re-strung in time for another tune. Check out the fabulous video below.